Smoking is bad for you but you can’t seem to quit and you’re not alone. Quitting is one of the hardest things you may ever do but may also be the most rewarding. You see the commercials on television with the health issues from smoking yet you continue to puff away. Logically you know smoking is bad for you, but quitting seems so hard! What’s up with that? While the conscious thinking mind knows smoking is bad for you there is some benefit or habit that keeps you puffing away. Hypnosis can help you quit however, you can try the simple technique below to stop smoking on your own. Take a deep breath every time you desire a cigarette. A really deep breath mimicking the way you smoke. Keep breathing deeply while you massage you hands or temples. This will give you something to do with your hands instead of holding the cigarette. Studies show the urge only lasts for several minutes so while you breathe in clean fresh air play your favorite song and remind yourself of the benefits of being a non smoker. Allow the urge to smoke to pass. Give it at least 3 minutes. 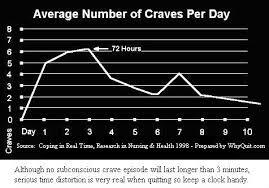 Relax your body and assume the posture like you do when you smoke.The chart below outlines the average number of craves daily. You may experience more or less. Do the breathing exercises consistently. Practice even when aren’t craving. Recondition yourself to breathe clean fresh air. If you still can’t quit . Call me. The results are amazing with hypnosis! Many people are able to quit smoking in only one hypnosis session. There are a few exceptions to every rule and I know it sounds out of the ordinary but it’s true in only one hypnosis session it is possible to be a nonsmoker. In fact hypnosis may help you get rid of all types of negative behaviors and achieve many goals in your life. Hypnosis works by bypassing the monkey chatter in the conscious thinking mind and connect with positive thoughts, feelings and behaviors needed to achieve goals. The mind is so powerful that when properly focused it can and will accomplish goals like smoking cessation more quickly. Some people may need more than one session. It all depends on how bad you want to quit. Hypnosis is not a magic bullet, as a matter of fact there are NO magic bullets! There are no guarantees. Your success is my success and I have plenty of success stories like the client who gave of smoking AND soda in one session. All hypnosis is self hypnosis and your success is determined by you.